In this image released by Disney, Geoffrey Rush portrays Barbossa, left, and Johnny Depp portrays Captain Jack Sparrow in a scene from "Pirates of the Caribbean: Dead Men Tell No Tales." Well into the fifth installment of the “Pirates of the Caribbean” series, Captain Jack Sparrow sees a wanted poster with his head on it — one of many on the island of St. Martin — and the reward money reduced several times until it is a mere British pound. Symbolically, this could mirror the waning interest of the rapscallion antihero, the swashbuckling series, even Depp himself as a profitable lead. How many times do audiences want to see an old drunk fall backwards into treasure, out of prison, and back to the seas? We actually see pirates debate this issue in “Dead Men Tell No Tales,” which continues the themes of fathers and children, legacies and vendettas, and freedom of the seas. Jack Sparrow is a somewhat tolerated relic in the colony of St. Martin, five years after Blackbeard trapped his beloved ship The Black Pearl into a small bottle that Jack keeps close to his heart. Four years before that, a young Henry Turner locates the shipwreck of the Flying Dutchman, which reanimates and reveals his father, Will (Orlando Bloom), who is cursed to live on it. Before returning to the shore, Henry promises his father that he will break the curse. Years later, Henry (Brenton Thwaites) is a scholar of nautical mythology aboard a British naval ship. He tries to warn his commanding officer that the ship is heading for the Devil’s Triangle and is soon imprisoned below deck for insubordination. 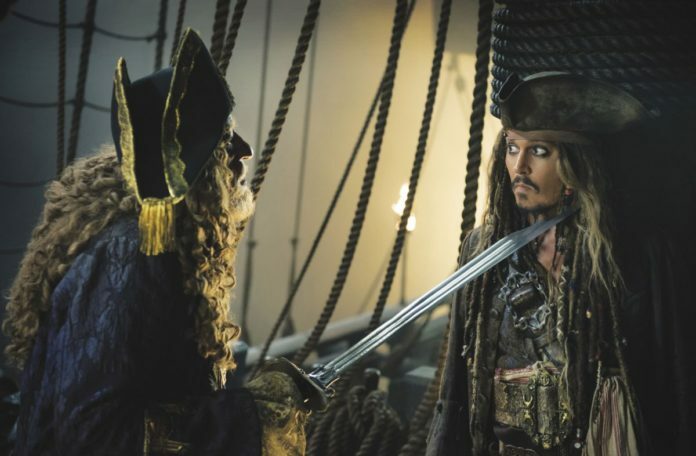 Naturally, the ship is quickly destroyed and Salazar (Javier Bardem), the undead captain of a skeletonized Spanish galleon, spares his life in exchange for help finding Jack Sparrow, who caused his fate years ago. Unlike the elder Turner in the first movie, the younger Turner has rather scrawny sea legs and has more book knowledge than real experience of the seas. Back on land, a smart young woman named Carina (Kaya Scoledario) is accused of being a witch because she reads books and studies the stars using a book that once belonged to her absentee father. Henry hasn’t proven much use to anyone yet but Carina can’t walk the streets unchaperoned — that would make her a slutty, smart, witchy woman — so she basically just needs his physical presence in order to avoid hanging. Carina is rarely given her moment in the sun, however, as she is able to pick the locks of her jail cell but after recapture, is soundly ignored during her last words on the scaffold. Sparrow hogs the limelight of their shared execution on his platform, where he will be beheaded by guillotine for the charge of bank robbery, though by this point I’d think his case file would allow any gaol officer or soldier to shoot him on sight. Instead, the townspeople of St. Martin must be the most bored citizens of any colony as they spend more time watching Sparrow’s shenanigans, open-mouthed and wide-eyed, then actually pursuing him. Also, the town must only have one street because Sparrow’s men get away with pulling an entire bank building from its foundations using a team of horses and no one tries to confront them from the front or sides. Maybe Sparrow isn’t inept after all these years; he might be just slowly curdling from ennui after living amongst so many mouth-breathers. As Salazar, Bardem kicks up the menacing intensity as a former captain in the Spanish Navy who, in retaliation for the murder of his father and grandfather, vows to rid the seas of every pirate. It was a young Sparrow who led Salazar’s ship into the Triangle, and his rage boils at Sparrow being the one who got away. Of course, in the years since Salazar’s curse, piracy is again booming, and Jack has never lacked for enemies and traitors. Aside from Barbossa (Geoffrey Rush), Jack is the foremost expert on the life of the sea, especially its unpredictability, freedom, and ruthlessness. Land is the prison without bars for men like Jack, and the infinite waters inspire a certain honor amongst thieves. Salazar, however, doesn’t consider pirates as men: they are as good as barnacles leeching on the undersides as ships and need to be scraped away. As with other men who try to control the sea, this is a fruitless task against its mercurial temperament. The MacGuffin in this film is the trident of Poseidon, which has the power to lift all curses and control the seas (though, doesn’t this contrast with the logic of … eh, it’s a theme-park ride). Maybe the greatest treasure is love, or friendship, or just a ship. When the journey towards the trident actually happens because they let a woman drive for once, it is cold comfort at its discovery as nothing new has actually been found. Could this be the ultimate pirate curse: repetition? All the bounties in the world couldn’t buy a bar of soap and a first-form reader, so why should a giant iridescent spork bring illumination? Charisma can only hold out so long against a lack of originality.